WASHINGTON – A passenger train carrying several GOP lawmakers hit a truck in the hills of Virginia. The White House said in a statement that one person was killed and another seriously injured. Officials said more passengers suffered minor injuries. Many Republican members of Congress were on the train, heading to a yearly retreat at the Greenbrier, in White Sulphur Springs, West Virginia. Some of the lawmakers on board are doctors who assisted the injured, including Reps. Larry Bucshon of Indiana, Roger Marshall of Kansas and Brad Wenstrup of Ohio, all of whom also have medical degrees. My wife Kathryn and I were traveling to the annual House Republican retreat when our train collided with a truck, we are ok. We went to the scene and did what we could to help the injured. Our thoughts and prayers are with the victims of this tragic accident and their families. A New York train accident lawyer says passengers often suffer severe injuries in similar train crashes, and insurance alone may not provide enough compensation to give them the best medical treatment possible. In at least one case, nothing will ever replace the family member who was killed in the Crozet, Virginia train accident; but family members can file a wrongful death claim that can not only provide them with compensation — it can also force train companies to make vital changes that would prevent future accidents from happening. Was the truck driver licensed? Did the truck driver have the right of way? Can the company the driver was working for be held responsible? Was the truck driver awake and alert at the time of the crash? The answers to these questions can be vital for train accident victims and the families seeking compensation after a devastating crash. According to Amtrak, two crew members and three passengers were taken to area hospitals to receive treatments following the Crozet, Virginia train accident. Some of these victims may never make a full recovery – physically or mentally – which is why it’s important for all train accident victims to receive fair and just compensation after any crash that could have been prevented. 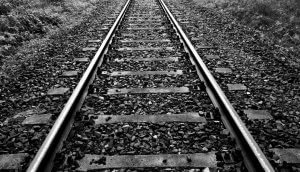 For more information on train accidents, or to file a claim, follow this link. NEW YORK – A string of recent accidents — including one that killed Kevin Flores, 13, of Queens — highlights the need for more stringent criminal penalties against drivers who are operating trucks without a license, but it also puts a spotlight on the companies that pay them to do it, neighborhood watchdogs say. Police reports suggest that Philip Monfoletto, 28, was at the wheel of an oil tanker truck with a suspended license when the big rig slammed into Kevin Flores, who was riding his bicycle on Lewis Avenue in the Bed-Stuy neighborhood of Brooklyn. 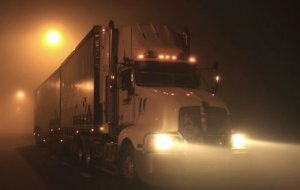 A New York truck accident lawyer says while unlicensed drivers often face criminal charges after accidents like the one that killed Kevin Flores, the companies that employ drivers may not be charged with anything; but they can be held responsible for an accident in civil court. The law can be complex when it comes to filing a wrongful death or other personal injury claim, but a New York truck accident lawyer can help victims and their families get the best result possible from these claims. In fact, studies have found that when a New York truck accident lawyer gets involved in a case, the value of that case jumps by four times or more. A wrongful death claim will not only seek financial compensation for a victim’s family — it can also spur more important changes to prevent similar accidents from happening in the future. 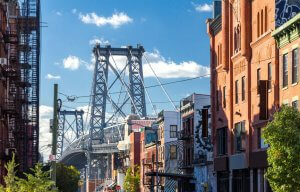 Neighborhood leaders are already examining the hiring processes of some New York companies that had unlicensed drivers operating trucks and other heavy machinery. A successful lawsuit could force these companies to create new policies that would prevent dangerous drivers from getting the keys in the first place. Many community leaders would welcome these policies, particularly after a heartbreaking accident that could have been prevented with simple background checks and training. According to the Daily News, Monfoletto’s license has been suspended seven times, and he has a lengthy criminal history on and off the road. He currently charged with aggravated unlicensed operation of a vehicle. NEW YORK – A 31-year-old man is fighting for his life at a New York City hospital after he was run over and pinned under the rear wheels of a tractor-trailer, police said. According to the Daily News, city officials said the man was jogging alongside the truck around 1 a.m. Monday morning. At some point, the jogger attempted to cross Amsterdam Ave. on the Upper West Side of Manhattan, resulting in the serious collision. He was taken to Mount Sinai St. Luke’s hospital where he underwent surgery for his injuries, police reported. A Manhattan truck accident lawyer says accidents like this often result in catastrophic injuries. These are some of the most serious injuries a victim can experience as a result of an accident; they’re some of the most costly injuries to treat. For many Manhattan truck accident victims, they will not have to bear this burden alone. In 2017, victims of car and truck accidents who sought legal counsel obtained four-times more compensation on average than their counterparts who dealt with insurance companies alone. The compensation these victims ultimately receive not only helps pay for medical bills – but it can also cover lost wages, pain, suffering, loss of a family member or companion, transportation costs, and more. A Manhattan truck accident lawyer says talking with an experienced attorney is a crucial step that victims and their families should take in the hours and days following an accident. In some cases, a personal injury law firm, like Cellino & Barnes, will provide victims with a FREE consultation, and guarantee no fees unless they win your case. Since most New Yorkers don’t have to deal with truck accidents and injuries regularly, many are not familiar with the complexities of personal injury litigation, and the challenges a person may face when trying to obtain fair compensation from the insurance company. A FREE consultation can provide victims with important information and insights into this process. Every Manhattan truck accident has a set of unique circumstances that the insurance company will be looking at; it’s only fair to have professionals in your corner whose goal is to make sure you get the best result possible, lawyers said. The jogger who was pinned under the tractor-trailer early Monday morning suffered extensive upper body and leg injuries, police reported. The truck driver remained at the accident scene and was not charged. 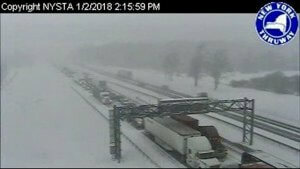 BUFFALO, N.Y. – New York State Police have confirmed that one man was killed, and several others injured in a massive pileup accident on the New York State Thruway near Buffalo. At least 20 vehicles were involved in the chain-reaction crash as a blizzard created white-out conditions in the area Tuesday afternoon. Authorities say as many as 75 vehicles may have been damaged in the massive pile-up in Cheektowaga, a suburb of Buffalo. A Buffalo car accident lawyer says many drivers and passengers may be entitled to significant compensation if they were injured or killed in the pileup accident. This compensation can cover medical bills, lost wages, pain, suffering, and more. In accidents like this one, which closed the NYS Thruway for hours, having a personal injury firm in your corner is crucial. The law offices of Cellino & Barnes, for example, often obtain settlements and verdicts for their clients that are worth significantly more than what insurance companies offer victims without representation. Some of the injuries reported in the pileup are considered ‘minor,’ but a Buffalo car accident attorney says an aching neck could be a sign of more severe damage, and it should not go unaddressed. A Buffalo car accident lawyer suggests every ache and pain – minor or severe – be documented and analyzed by a doctor. Unfortunately, accidents like these also come with more severe injuries — and even death. According to State Police, Edward Torres, 64, of Elba died in the pileup accident, and another traveler was seriously injured. Police said Edward Torres was unable to stop on the slick roads, and his vehicle crashed into the back of a tractor-trailer. Other drivers had similar experiences, as dozens of cars became ensnared in the weather conditions and the accident scene. Current reports suggest Edward Torres was the only fatality in the massive pile-up but dozens of other drivers and passengers suffered injuries. Whether you are a victim or a family member, a FREE CONSULTATION with an experienced personal injury lawyer could help determine the proper course of legal action after an accident.